The Musto Highland Jacket is certainly something of a legendary jacket, in as far as a shooting jacket can be legendary that is. Over 20 year ago Musto became the first people to build a shooting jacket using GORE-TEX®. I’m often asked to recommend the ‘best shooting jacket’ and whilst it is an impossible question because it depends how you want to use it, when a person wants a jacket suitable for the very worst mother nature can do, that will stand the test of time, I always go straight to the Highland, because quite simply I have confidence in it. There are 2 ways of approaching the design of a product: to a price point or to a quality standard. The Highland was designed to meet a standard, which was to be the ultimate jacket for the very worst weather. Whilst this means that it isn’t cheap, when you consider this jacket cost £300 over 20 years ago, to still be only £360 now is pretty good. What’s more most people get comfortably 10 years plus wear out of a Highland jacket, which average out to a pretty cheap coat! My personal favourite feature is the enormous collar. When lifted up with the storm flap closed, you can tick yourself cosily down inside against the cold wind and rain, and the collar is deep enough that it comes right up to a cap at the back. For the sake of balance I feel I should cover the downsides of the coat too, and whilst it doesn’t have many, the styling does mean it doesn’t fit everyone. To keep all that rain out, it is a genuine three quarter length, and that means it’s rather long on the shorter members of society. But if your 6’ plus and solidly built it will look cracking on you! 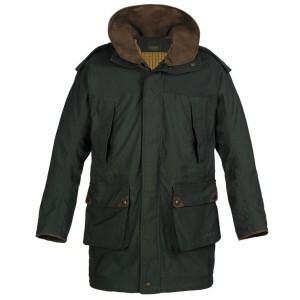 Gore-Tex Shooting Jacket, Musto Gore-Tex Shooting Jacket, Musto Highland Jacket. Bookmark.